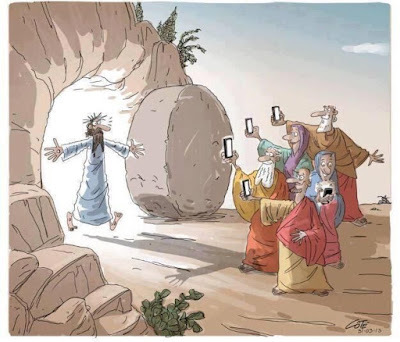 Most preachers during the Holy Week and Easter try to remind the listeners of the story of long long ago and we all attempt to visualize the chain of events surrounding Jesus in 'those' times. Then, and only then, do we try to apply it to ourselves. However it is always two different time zones. Different ages. Different lifestyles. Different people. Yet not much is different. Human nature remains the same. Societal structures and functions remain the same. Divinity remains the same! Even today we fight, squabble, gossip, slander and bring down the just and innocent - just as all those characters involved in the Passion narratives. Even today there are people who do good and help others, in spite of all that they have to face - just like the women who assisted Jesus all his public life, even in death. Kings and rulers still call the shots on behalf of politicians and businessmen - just as Pilate and Caiphas did. Religion still continues to sway mobs. And God, well He still loves us - just as He loved Jesus and all in His times! Of course, if the cell phones were present then, there would certainly have been photographic evidence of Jesus' resurrection too!